Kenneth Johnson, director of the Zanvyl Krieger Mind/Brain Institute at Johns Hopkins, died May 12 of colon cancer. He was 66. "Ken was one of the country's leading systems neuroscientists," said Solomon Snyder, Distinguished Service Professor and director of the Department of Neuroscience. "He revolutionized our understanding of how the brain integrates information about touch and related sensations. He was also a wonderful citizen of Johns Hopkins. He will be sorely missed." Born May 18, 1938, in Canada, Johnson was the descendant of Icelandic immigrants. He grew up in Seattle and did his undergraduate work at the University of Washington. At the age of 30, after working at General Electric for a number of years, Johnson came to Johns Hopkins as one of the university's first graduate students in the Biomedical Engineering program. He completed his doctoral work in the laboratory of Vernon Mountcastle, who last week described Johnson as "the finest graduate student I ever had, bar none." Immediately upon completing his doctorate in 1972, Johnson was named an assistant professor at Johns Hopkins. He left Baltimore to work at the University of Melbourne with famed neuroscientist Ian Darian-Smith, who had been in the Physiology Department at Johns Hopkins from 1969 until 1972. Johnson returned to Johns Hopkins in 1980 as an associate professor of neuroscience. 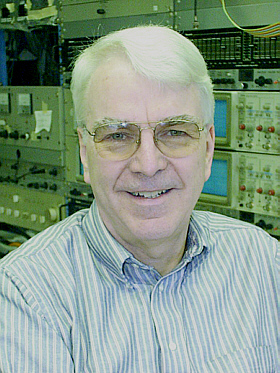 Johnson's research focused on the neural mechanisms of tactile perception in the hand. To a great extent, he and his colleagues were able to solve the lab's original question of how sensory function in the human hand is organized. The receptors and nerves responsible for form and texture perception, motion perception and transmitted vibration perception were defined by their studies. In recent years, the lab's focus has been on how tactile perception in the hand is reflected in the brain; that is, the details of how form, texture, vibration and motion are organized in the somatosensory cortex. To answer these questions, his lab studied the behavior of individual and populations of neurons. In addition to his research, Johnson was active in teaching and in administration as director of the Mind/Brain Institute. He co-directed the Neurosciences Graduate Program for a decade, greatly enhancing an already superb program and bringing it to a position of national leadership, according to Snyder. "His direction of the Mind/Brain Institute was insightful and farsighted," Snyder said. "He recruited faculty in diverse areas and inaugurated a major undergraduate degree-granting program in neuroscience on the Homewood campus. Despite his many accomplishments, Ken was at all times a modest, self-effacing individual who let his deeds speak for themselves." Johnson is survived by his second wife, Jennifer, and two children from a previous marriage. His son, Myron, and daughter, Lissa, both live in Australia. GO TO MAY 16, 2005 TABLE OF CONTENTS.